I happen to use the Amazon cloud machines from time to time for various personal and work-related projects. Over the years I've accumulated a terabyte or so of data files there. Those are mostly useless intermediate results or expired back-ups, which should be deleted and forgotten, but I could not gather the strength for that. "What if those datafiles happen to be of some archaelogical interest 30 years from now? ", I thought. Keeping them just lying there on an Amazon machine is, however, a waste of money - it would be cheaper to download them all onto a local hard drive and tuck it somewhere into a dark dry place. But what would be the fastest way to download a terabyte of data from the cloud? Obviously, large downstream bandwidth is important here, but so should be a smart choice of the transfer technology. To my great suprise, googling did not provide me with a simple and convincing answer. A question posted to StackOverflow did not receive any informative replies and even got downvoted for reasons beyond my understanding. It's year 2017, but downloading a file is still not an obvious matter, apparently. Unhappy with such state of affairs I decided to compare some of the standard ways for downloading a file from a cloud machine. Although the resulting measurements are very configuration-specific, I believe the overall results might still generalize to a wider scope. An m4.xlarge AWS machine (which is claimed to have "High" network bandwidth) located in the EU (Ireland) region, with an SSD storage volume (400 Provisioned IOPS) attached to it. The file needs to be transferred to a university server located in Tartu (Estonia). The server has a decently high network bandwidth and uses a mirrored-striped RAID for its storage backend. Our goal is to get the file from the AWS machine into the university server in the fastest time possible. We will now try eight different methods for that, measuring the mean transfer time over 5 attempts for each method. One can probably come up with hundreds of ways for transferring a file. The following eight are probably the most common and reasonably easy to arrange. Server setup: None (the SSH daemon is usually installed on a cloud machine anyway). Client setup: None (if you can access a cloud server, you have the SSH client installed already). Server setup: sudo apt install rsync (usually installed by default). Client setup: sudo apt install rsync (usually installed by default). Client setup: sudo apt install wget (usually installed by default). 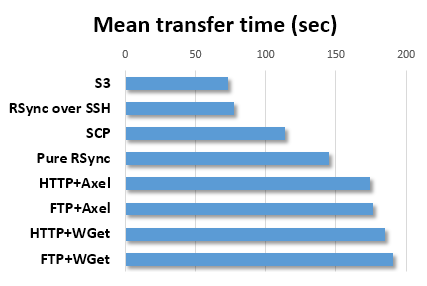 Axel is a command-line tool which can download through multiple connections thus increasing throughput. The last option we try is first transferring the files onto an AWS S3 bucket, and then downloading from there using S3 command-line tools. We create the bucket in the us-east-1 region because the S3 tool seems to have a bug at the moment which prevents from using it in the eu regions. aws --region us-east-1 s3 cp s3://test-bucket-12345/file.dat . Here are the measurement results. In case of the S3 method we report the total time needed to upload from the server to S3 and download from S3 to the local machine. Note that I did not bother to fine-tune any of the settings - it may very well be possible that some of the methods can be sped up significantly by configuring the servers appropriately. Consider the results below to indicate the "out of the box" performance of the corresponding approaches. Whenever you need to download large files from the cloud, consider RSync over SSH as the default choice.